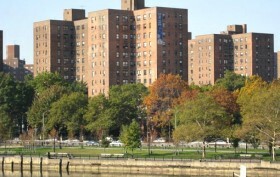 Like Stuyvesant Town, the Riverton Square residential development in Harlem opened in 1947 as an affordable complex for World War II veterans and was built by the Metropolitan Life Insurance Company. But unlike Stuy Town (and Met Life’s Parkchester in the Bronx), black and Hispanic tenants weren’t barred from renting in Riverton. According to the Times, over the years the seven-building site was a sought-after address for the middle-class and was home to such notables as jazz pianist Billy Taylor, former Mayor David Dinkins, and former vice president of Motwon Records Suzanne de Passe. But in 2005, again similar to its downtown counterpart, Riverton was sold to Stellar Management, who tried to swiftly remove long-term tenants and replace them with higher-paying residents. Unable to convert the rent-stabilized units to market-rate and saddled with debt, Stellar lost Riverton to its lenders in 2008. This past December, after nearly a decade in limbo, the 12-acre site was sold to A&E Real Estate Holdings for $201 million in a deal with the city which, like the recent terms at Stuy Town, dictated that 975 of the complex’s 1,229 units be reserved for working- and middle-class families for 30 years. In return, the buyer will receive about $100 million worth of tax breaks and incentives. The waitlist is now open for these affordable units, and 7,500 randomly selected applicants will earn themselves a spot.